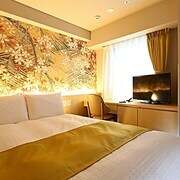 Top 10 Kanazawa Hotel Deals from ￥3,958/Night! Affectionately known as “Little Kyoto”, Kanazawa’s historical charm has only become more popular since the Hokuriku Shinkansen bullet train launched operations in 2015. 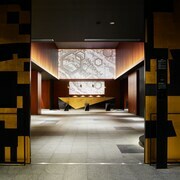 As the defacto capital of the Hakuriku area, Kanazawa is ground zero for a delectable range of regional gourmet seafood, stands as a City of Crafts and Folk Art within the UNESCO Creative Cities Network, and is widely considered the most well-preserved Edo-era city in the country. 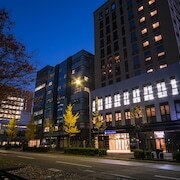 Kanazawa has been a popular domestic destination for ages, but due to its relative remoteness and until recently the lack of a shinkansen connection, foreign tourists are only starting to wake up to all the city has to offer. 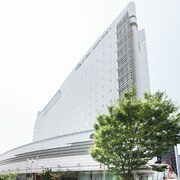 As such, most hotels are domestic chains and are located close to the central Kanazawa Station. 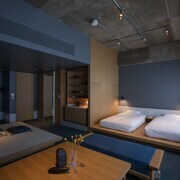 Here, you can find the standard range of high-end domestic (we suggest the Nikko Hotel in its distinctive 130 meter tall tower) to cheaper ryokan inns. 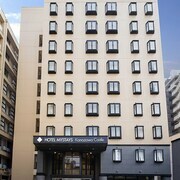 Whatever your budget, look to Expedia for the best rates and best availabilities for Kanazawa hotels. Without a doubt, Kanazawa’s most famous site is the majestic Kenroku-en Garden, one of the Three Great Gardens of Japan and once the personal pleasure grounds of the ruling Maeda feudal lords. Explore these intimate grounds and then stroll a short distance to the Nagamachi Samurai District and its narrow streets lined by lovingly-recreated feudal samurai housing. Kanazawa Castle is one of Japan’s largest and most imposing, while the 21st Century Museum of Contemporary Art offers a nice change of pace. For most overseas tourists, no visit to Kanazawa would be complete without stopping by Myoryu-ji – the Ninja Temple. Chalk-full of hidden rooms, secret passages, trap doors, and escape tunnels, this temple is allegedly where numerous ninja assassinations occurred; there is even rumor of a hidden tunnel connecting to Kanazawa Castle, providing the Maeda lords a quick escape route. 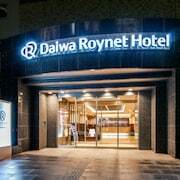 Book your next Kanazawa trip with Expedia and be confident that you’ve found the best hotel for your needs at the best rates available. 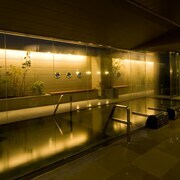 Explore Kanazawa with Expedia’s Travel Guides to find the best flights, cars, vacation packages and more!